Currently browsing posts filed under "Amherst"
Does Amherst Lie About Its Admissions Data? I think that Amherst is “lying” about its admissions data. Recall this discussion and this one. 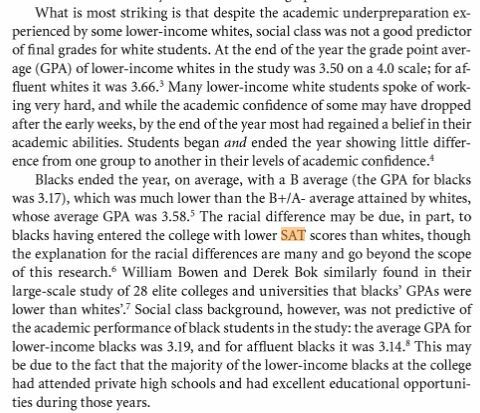 There is simply no way for an elite liberal arts college to have competitive sports teams (especially in male helmet sports) and meaningful racial diversity (especially African-American) without around 5% of the student body having either math or verbal SAT scores (or both) below 600. Amherst consistently reports SAT plus ACT totalling 100% of their enrollees (or the 99% that results from adding rounded numbers). Both Swarthmore and Williams are consistently reporting a total SAT plus ACT in the 110% to 120% range. 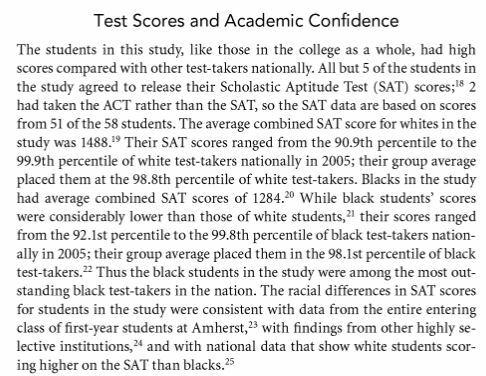 Clearly what is going on here is that Swarthmore and Williams are reporting both the SAT and ACT for students submitting both (as they are supposed to according to the instructions). Amherst is not. Amherst is pulling a “Middlebury” and only reporting whichever score (SAT or ACT) they used for admissions purposes, presumably whichever is higher. (I know that they receive both scores for the dual test takers). It is incomprehsible that not one single enrolled Amherst freshman took both the SAT and the ACT when 20% of both Williams and Swarthmore’s freshman classes the last two years took both. There is a great story here for the Record, or for The Amherst Student . . .
Why can’t Williams be equally transparent (and competent!) in its decision-making? 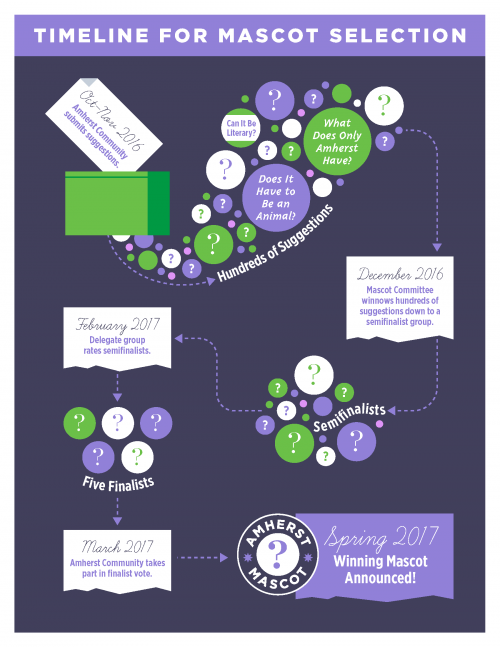 Our main hope for a disaster is that the committee, choosing from the 30 semi-finalists, selects at least one easily mockable mascot for inclusion among the five finalists, and then the students vote for that one as a joke. That is a thin reed! Hey, Biddy! When you are so left wing that you have lost the theatrical designers, you might have a problem. 1) There is enough meat in this article for a week of quotes and comments. Worth it? 2) No mention of Williams! A good thing — because Williams is handling current controversies better than schools like Amherst — or a bad thing because we want any article that mentions Yale to mention Williams? 3) Any word on changes in donations to Williams? None that I have heard. 4) Any speculation as to the reasons why Williams suffers less turmoil? The Administration might like us to believe that they are better maintaining a calm/happy campus than their counterparts at Amherst/Yale are, but I doubt that that is the explanation. More likely is that Williams is today, as it has always been, among the most “conservative” — or, better, “least leftist” — among elite LACs, both in terms of the students it attracts and its campus culture. Other opinions? 5) My sources report that the most common political question Falk gets at alumni meetings concerns the self-inflicted wound of the Derbyshire cancellation. Can any readers provide reports from their local events? An earlier version of this article misspelled the first name of the colonial commander for whom Amherst College is named; it is Lord Jeffery Amherst, not Jeffrey. The town of Amherst was named after Lord Jeffery, and the College was named after the town. Well, which is it? Perhaps some of our historian readers (dcat?) could help us out. 2) Diversity is the godhead, not only at Williams, both also at Amherst and the New York Times. One can make a factual claim that Amherst is, for example, one of the most expensive colleges in the country. Tuition is measured in dollars. But how is “diversity” measured? What makes Amherst more (or less) diverse than Bates/Middlebury/Williams/wherever? This is an honest question! I suspect that, for the Times, “diversity” means “least white.” Does someone have a better definition? This letter from the Amherst Trustees is not — How to put this kindly? — a model of clear writing. And I agree—with the first part of the sentence and also with the “but.” The controversy over the mascot may seem small in itself and yet in many minds it’s symbolic of larger issues. The controversy is bound up with feelings about matters as specific and recent as the protests at the College last fall and as broad and old as the College’s mission and values. It’s bound up with personal memories and personal experience. I’ll come back to the mascot shortly, but the larger issues deserve some recognition first. The Jumbos saw their five-game unbeaten streak broken the day before with the loss to the Amherst Lord Jeffs at home. If the people at Tufts (and Bates and Williams and . . .) continue to refer to the “Lord Jeffs,” then it doesn’t really matter if the Amherst Trustees have primly turned up their sensitive noses to its usage. If everyone — include Amherst athletes (and coaches? and fans?) — continues to use “Lord Jeffs,” then the Trustees have accomplished nothing but to assuage their own consciences and to infuriate the social justice warriors on their own campus. Should I spend a week fisking the letter or is this topic too boring to bother? This provides Adam Falk (and Williams coaches) with some outstanding trolling opportunities! Whenever interviewed by NESN or any media outlet, always use the term “Lord Jeffs” when describing the opponent. Entire letter before the break, saved for posterity. Love the part where the audience giggles when D’Souza quotes Martin Luther King. Stay classy Amherst! 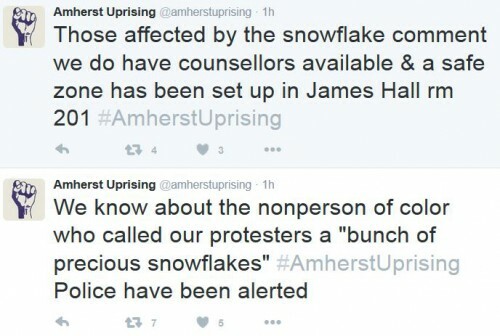 Amherst is descending into the insatiable maw of vicious political correctness. Let’s spend a week mocking them! This is Day 5. Here is an account of last week’s events from an Amherst parent about the experience of his son at the library sit in. Indeed. This is a common reaction among white/Asian students. One thing my son reported was that there were a lot of threats made against white students who somehow were not present in the library at the sit-in, as if non-presence at an unannounced event was somehow in and of itself racist. The general tone of the discussion was very authoritarian — everyone should be forced to be here, everyone should be forced to take diversity courses, etc. Correct. We saw the same thing at Williams during Stand With Us in 2008. A sleepy New England town was not so sleepy late last Wednesday night, as hundreds of students, faculty and staff poured from a packed Baxter Hall into the Williamstown streets, loudly promoting Stand With Us’ message of respect. That the movement — and this rally in particular — has galvanized much of the campus is undeniable. Yet for all the good energy that poured forth on Wednesday, a little bad energy seeped through as well, and threatened to add a tinge of dissatisfaction to an otherwise successful evening. This dissatisfaction is due in large part to how a few members of the march handled students studying in Schow that night. In several instances those in the library that didn’t join in were yelled at and made to feel uncomfortable. Some who did not immediately stand with the rest of the group were intimidated into doing so. Funny how these protests move so quickly from complaints about oppression to confrontations with other students. In any event, we should not be surprised that Amherst, being Amherst, the movement has completely fizzled. The protesters are so lame that they declare victory when their demands are “acknowledged.” Pathetic. And after I offered them some genius advice! Pearls before Jeffs . . .
As an important note, the movement, both at its inception and now, by no means intends to stifle free speech. Such allegations are misinformed and misguided. President Martin must issue a statement of support for the revision of the Honor Code to reflect a zero-tolerance policy for racial insensitivity and hate speech. At Amherst, the average math + reading SAT scores of male Asian-American students is more than 150 points higher than those of male African-American students. This isn’t racial sensitive but it is, for good or for ill, the truth. Would Amherst Uprising protest against an Amherst professor who mentioned this fact in class? I bet they would! Recent letter from Amherst Uprising below the break. 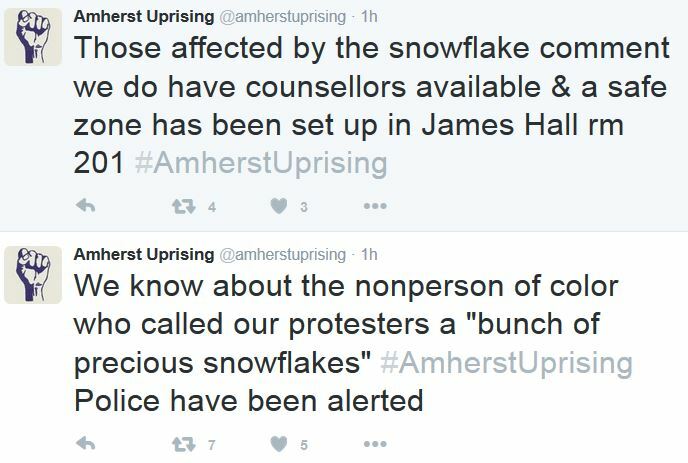 Amherst is descending into the insatiable maw of vicious political correctness. Let’s spend a week mocking them! This is Day 4. And the administration will ensure that no students, faculty, or staff members are subject to retaliation for taking advantage of their right to protest. Did an Amherst lawyer vet this? What an absurd (and dangerous) promise to make! “Right to protest” is a very different thing than the right to free speech. I am writing this prior to the events, if any, on Wednesday, but hasn’t Martin given the students carte blanche — Is that word a micro-agression?! — to do anything they want, short of violence? Imagine students protest by shutting down the presidents office (or the presidents house!) by refusing to leave. Martin has just guaranteed that they won’t be punished? What if they occupy the two or three largest lecture halls on campus, thereby preventing classes from meeting there? Again, they can’t be punished! Amherst has committed itself to equal opportunity for the most talented students from all socio-economic circumstances. The College also has a foundational and inviolable duty to promote free inquiry and expression, and our commitment to them must be unshakeable if we are to remain a college worthy of the name. The commitments to freedom of inquiry and expression and to inclusivity are not mutually exclusive, in principle, but they can and do come into conflict with one another. Honoring both is the challenge we have to meet together, as a community. “Inclusivity,” thy name is “Speech Code.” Either Amherst students have the same free speech rights as UMass students or they don’t. Which is it? Getting clarity on that point (at least for Williams College) is perhaps the most important issue in this debate. What do our readers think? Those who have immediately accused students in Frost of threatening freedom of speech or of making speech “the victim” are making hasty judgments. If I were an Amherst trustee, I would be reaching for George Orwell right about now, and wondering if I can trust Martin to be truthful. The protesters have demanded punishment for other Amherst students whose only “crime” was to put up posters about free speech. If this isn’t “threatening freedom of speech,” then words have no meaning. It takes time, attention, and serious discussion to sort out and make clear how we protect free speech while also establishing norms within our communities that encourage respect and make us responsible for what we do with our freedom. That is the discussion we need to have. Does Amherst have a history of left wing presidents? President Martin, like President Marx before her, is certainly more stridently leftist in her pronouncements (and career?) than any Williams president. You heard it here first: Why not rename Amherst? The student protesters don’t like the Lord Jeff mascot because Lord Jeffrey Amherst fought the King’s enemies in ways of which they disapprove. They want a new mascot. Fine. But the college would still be called Amherst! (I am hazy on whether this Amherst (the town?) is also connected to Lord Jeffrey.) So, why not solicit a gift for a billion dollars or so from some really rich megalomaniac and rename Amherst after him? Everybody wins! And I even have a candidate: Weill College, after Citigroup’s Sandy Weill. This is perfect because a) Biddy Martin has raised money from Weill before, b) Weill has (at least?) a billion dollars and c) the Weills have tried before to get a college named after them. Amherst is descending into the insatiable maw of vicious political correctness. Let’s spend a week mocking them! This is Day 3. The organizers of the protests also presented me with a list of demands on Thursday evening. While expressing support for their goals, I explained that the formulation of those demands assumed more authority and control than a president has or should have. Hmmm. This might be a good strategy in that, if the President really can’t do thing X, then how can the protesters demand that she does? 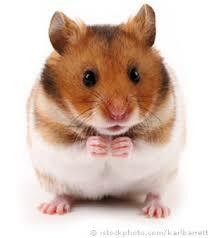 But, like the teller reporting to the bank robber that there is no money in the till, it is risky. First, college presidents are, on some dimensions, fairly powerful. There is a lot that Biddy can, in fact, do. Second, if she really does “support” the goals (and the demands? ), then she is just passing the buck to whomever (the trustees? the faculty?) actually run the College. If I were an Amherst trustee, I would want Biddy to take responsibility for saying “No” to these brats. I would not want them bothering me. Our students’ activism is part of a national movement of students who are devoted to bringing about much-needed change. They are exercising a fundamental American right to freedom of speech and protest. Do students have free speech rights at Amherst? FIRE says No, giving Amherst a Yellow Light rating. (Sadly, Williams gets a Red Light.) I ask this question in all seriousness. Compare Amherst to UMass. Students at the latter have free speech, due to a long line of court decisions outlining that no part of the government, including state colleges, may violate the First Amendment. But those cases do not apply to private colleges like Amherst? So, is there something that a UMass student could say without fear of university retaliation but which would, if said by an Amherst student, result in punishment? Slogan: “End Lectures As Normal.” This is supposed to be a play on “End business as usual.” Does it work? Suggestions welcome! Goal: Stop all large lecture classes from meeting together in their usual lecture halls. I don’t know enough about Amherst to target specific classes/rooms, but there must be some, probably fewer than a dozen, with more than, say 40 students. Method: Have at least one student (or, ideally, two or more) go to the lecture hall a few minutes before the start of class. Stand at the front of the room at the podium. Start reading aloud material relevant to the Amherst Uprising movement. Content does not actually matter but more relevant is better. You are like a filibustering Senator, so even just reading a compilation of all the supportive letters/emails you have received is fine. The important thing is that you are, non-violently, taking over that lecture hall and freely speaking about what matters to you and what should, indeed, matter to everyone at Amherst. And you are not going to stop talking, even if the professor asks you to, even if she just wants to start class, even if the students start to complain. You are standing witness. You will not be silenced. In fact, you are available to help the professor with this process by providing her with a list of smaller classrooms, their seating capacity and their current availability. In fact, you have already prepared a possible schedule for her! Result: No student is hurt. (A few may be slightly inconvenienced by having their classes meet at different times/locations.) If anything, students are better off. A discussion section of 20 is a much better way to learn statistics than a lecture of 80. Yet the professors are very annoyed. They don’t want to quadruple their teaching time. They like large lectures. Unfortunately, as much as you probably like these professors, you have to annoy them. You have to (non-violently and using your free speech rights) make their lives difficult enough that they will force the Administration to change. It is very hard for you to get President Martin to do what you want. It is much easier for a group of inconvenienced Amherst professors to do so. Force them to only teach students in classes of 30 or smaller, and they will do whatever is necessary to make your protest go away. Even better, it is hard/impossible for the professors to complain to you. After all, many of them have sent you letters of support! They are on your side. And you are not preventing them from doing their jobs. They can still teach their classes, as long as they do so in smaller settings. Pushback: Might the Administration come down hard against you? We should be so lucky! You are non-violent. You are doing nothing but speaking. You are even providing convenient lists of alternate times/locations where classes can occur. How can they attack you? And, even if they do, what are their options? Send in security? You then refuse to move; link arms; go limp. You use all the best non-violent tricks to stand your ground. Are they going to call the Amherst police? Arrest you? If they did that, hundreds of students would rally to your side. Your movement would be unstoppable. President Martin is smart, so she would see the futility of using security and/or the police to force you out. Summary: Your biggest leverage point is the faculty. You are not powerful enough to force substantive change. Students never are. But the faculty is. You need to force — non-violently and cleverly — the faculty to force the Administration to agree with your demands. Preventing them from lecturing, while allowing them to teach the same material in small groups, is your best strategy. Good luck! Your friends at EphBlog wish you nothing but success. Amherst is descending into the insatiable maw of vicious political correctness. Let’s spend a week mocking them! This is Day 2. Consider some of the demands from Amherst Uprising. President Martin must issue a statement to the Amherst College community at large that states we do not tolerate the actions of student(s) who posted the ”All Lives Matter” posters, and the ”Free Speech” posters that stated that ”in memoriam of the true victim of the Missouri Protests: Free Speech.” Also let the student body know that it was racially insensitive to the students of color on our college campus and beyond who are victim to racial harassment and death threats; alert them that Student Affairs may require them to go through the Disciplinary Process if a formal complaint is filed, and that they will be required to attend extensive training for racial and cultural competency. I swear, this is not a joke! These clueless students really believe that free speech has no place on the Amherst campus. Zero-tolerance works out so well in other aspects of social policy that we ought to apply it to campus discussion and debate. What could go wrong?! Recall our discussions about the failed (and misguided) efforts to police student speech in the Williams honor code. Perhaps I have too much faith in Amherst President Biddy Martin, but I doubt that she will comply with these demands. The students have set a deadline of tomorrow. What is their best strategy? First, they should heighten the contradictions. They need some racist graffiti, some death threats on Yik Yak and/or some nooses left around campus. Alas, it is unlikely that these will just materialize. Skinheads are, sadly, a marginalized and underrepresented group at campus. So, Amherst Uprising may just have to create these epiphenomenon of the underlying racism that is everywhere. So, be it! Second, they should avoid getting caught in doing so! Nothing undermines campus activism more than unsuccessful false flag operations. Third, they should carefully plan their direct action. Suggestions from our readers? Tough to know the best plan without having a sense of their numbers. Maybe a sit in at the President’s Office? A blockade of major lecture halls? Most aggressive would be an attempt to organize a campus wide boycott of final exams. If no students take any finals, Amherst can’t fail all of them. Either way, good luck! The more that Amherst Uprising makes Amherst appear to be a seething cauldron of clueless leftism, the better for Williams. Entire list of demands, saved for posterity below the break. Amherst is descending into the insatiable maw of vicious political correctness. Let’s spend a week mocking them! This is Day 1. The Boston Globe provides a useful overview. 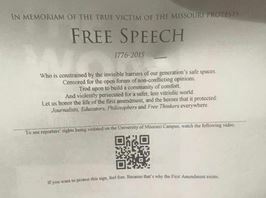 A group of 11 students at Amherst College, a private liberal arts school in western Mass., issued a list of 11 demands to administrators that includes making them apologize for signs that mourned the death of free speech. Via former professor KC Johnson, this is the sign. Could this all be a joke, or a false flag operation from someone like James O’Keefe? Or could these students actually believe that putting up a poster merits disciplinary action? Pass the popcorn! I hope these students bring Amherst to its knees! By the way, the Amherst Uprising twitter account linked above seems so absurdly over-the-top that it must be a parody. Right? UPDATE: It is a (genius!) parody. Well done Lord Jeffs! Here is the official account. The Williams hoops squads had a disappointing trip to Lefrak gymnasium in January. They are hoping to repay the favor tomorrow afternoon during the last regular season home game for seniors Troy Whittington and Harlan Dodson. Hopefully the students will get there early to pack Chandler, and boisterously support the home team with some creative cheers. Because, unlike the first meeting, these games count in the conference standings, the stakes are even higher. The winner of the men’s game between second-ranked Williams and third-ranked Amherst earns the right to host the NESCAC tournament (unless Amherst loses to Middlebury tonight while Williams beats Trinity; then, an Amherst win over Williams would result in a three-way tie, with hosting rights decided by a coin flip), which is especially crucial this year, since the second-seeded team will likely have to face an equally-talented Middlebury squad in the conference semifinal. Community college students can successfully transfer to some of the nation’s most selective four-year institutions and perform as well as those who start as freshmen, if they are given appropriate academic and social support, a new report on a five-year project by the Jack Kent Cooke Foundation finds. The Community College Transfer Initiative, started in 2005, provided about $7 million over four years to eight four-year institutions — Amherst College, Bucknell University, Cornell University, Mount Holyoke College, University of California at Berkeley, University of Michigan at Ann Arbor, University of North Carolina at Chapel Hill and University of Southern California — in an effort “to promote sustainable, long-term increases in the number of high-achieving community college students from low-income families transferring to the nation’s selective four-year institutions.” These institutions worked with nearby community colleges to eliminate kinks in the transfer process and also offered potential transfers specialized orientation and ongoing tutoring to smooth the transition. In recent years, some of the participating institutions — like Mount Holyoke — have formalized such transfer programs for the long term. See the whole article for links and details. Can any of our Amherst readers tell us about their program? My opinions are unchanged. Williams has, historically, made very limited use of transfers. And that is a good thing! We want to maximize the attachment that alumni feel to Williams and the best way to do that is to ensure that all of them are here for four years (or studying abroad with their Williams classmates). Transfers, whether they be from community colleges or Division 1 schools or the Ivy League, will, on average, feel less attachment. So, use those spaces for 4 year students. 1. Amherst was most pleased the past year to get a high number of top students who are also “stars” in their sports. These are students that will be impact players and do not require “tips” or whatever they are called in admissions. I forget the “label” the AD put on them….1A?. 2. Amherst is incorporating a program that introduce professors with students that play sports. Teams have faculty advisors and players work on community service projects with faculty, etc……all to reduce any “division” in perception mainly…between teachers and sport playing students. Varsity sports should be considered at Amherst as any other activity outside of class such as publications, singing, etc. It seems to be going well. 3. Coaches are taking a more aggressive approach in recruiting due to the changing world of college recruiting … even in Div3. The recruits are more knowledgeable about options, and top recruits are involved in their sports outside of high school….such as AAU/club teams and for longer periods of the year. 4. Once top impact students are identified, willing professors are encouraged to “recruit” the individual. 5. There are “particular” events that conference coaches are allowed to attend to see players and to be seen. These region wide events in a given sport bring together players that have been considered qualified academically for IVY schools, Patriot League schools, UAA, NESCAC, etc. Point one had been mentioned here previously. If true for Amherst and not for Williams (I have no idea either way), that is something Williams needs to work on — to the extent non-tipped athletes go on to become stars and not just minor contributors, that is a huge advantage when both schools are constrained to 66 tips, in total (and Williams is already at a slight disadvantage since those tips are allocated among more varsity sports than at Amherst). Point five I’ve also heard before, and point three does not surprise me. But points two and four are very interesting. I wonder if Williams does the same thing? I think that, time permitting, professors calling admitted students generally (not just athletes) makes a lot of sense. And while Williams teams are very active in community service (see the most recent examples here), I’m not sure whether they work together with professors on any of those projects. I wonder also if Williams teams have faculty advisors. Sounds like some ideas that are worthy of consideration. Many Ephs are familiar with the one thing Amherst has that Williams lacks: Antonio’s, a quality pizza-by-the-slice joint. (And no, Jeff, the opening of Supreme Pizza and Wings in North Adams doesn’t solve that problem). I’m sure most of you have been there after a basketball game or before vandalizing the Amherst sculpture garden. When a man wearing backstage Bob Dylan concert credentials around his neck walked into Antonio’s early Saturday morning, management at the pizza restaurant say they believed his claim that he was a member of the concert crew working at the Mullins Center during Dylan’s Friday night performance there. The man, who Antonio’s owner Walter Pacheco estimated was in his 40s, ordered 178 extra-large gourmet pizzas. The total bill, including delivery, would be $3,900. The man stood in the restaurant at 31 N. Pleasant St. for 10 minutes talking on his cell phone before leaving, promising to return to pay for the pizzas in several hours, Pacheco said. I guess he left the manager singing a cover of “A Fool Such as I”. And to those always seeking “more” and “bigger” concerts at Williams — I hope you’re ready to bail Hot Tomatoes out when this joker strikes again. Congrats to Williams on destroying Wesleyan on Saturday, earning at least a share of the NESCAC championship and earning the right to Walk (see photo below, and video here). But that is just the appetizer for what is sure to be a tougher test at Amherst. Last year, a 6-1 Williams team hoped to spoil the perfect season of 7-0 Amherst; they came agonizingly short. This year, the roles are reversed. Where to begin recounting how much is on the line for both teams? For 6-1 Amherst, a chance to earn some redemption after a discouraging loss to Trinity last week, breaking its 14 game winning streak; a tie for the NESCAC championship; a chance to beat Williams twice in a row for the first time since 1986; and the first home win vs. Williams for any member of the Amherst team. For 7-0 Williams, a chance to avenge last year’s heartbreaking loss to Amherst; a chance to win a solo NESCAC title for the first time since 2006 (the Ephs’ most recent undefeated season); and of course, new coach Aaron Kelton’s first Amherst game. Williams leads the all-time series vs. Amherst, 70-49-5. Previous posts on the history of the Amherst-Williams football rivalry, including links to various stories of interest, can be found here and here. Amherst is first in the NESCAC in scoring offense with an astounding 38.6 points per game; Williams is not far behind, at 37.4. Williams has the edge in defense, giving up only 13 points per game, as compared to Amherst’s 18.3. Williams leads NESCAC by a wide margin in total offense, while Amherst has been more opportunistic, leading the conference, also by a wide margin, in turnover margin. Williams previews the game (including viewing information) here, Amherst, here, the Chronicle of Higher Education (!) here, iBerkshires, here, the New York Times, here and here, and Fanhouse, here. [By the way, I will be attending my first Amherst-Williams football game since the 1997 48-46 classic, which will likely never be topped for drama. If you’re at the game, say hello — I’ll be the crazy shirtless guy painted head-to-toe in purple, and engaging in fistacuffs with the “Lord Jeff” … perhaps]. Below the break, my extended game preview, featuring key players to watch. More than fifty years ago, Ephs took the field against Amherst. Frank Uible ’57 led the way. Tomorrow, they will do the same. And ten years from now. And one hundred. Do our Eph football players recognize their history? TB Jones ’58, my father’s sophomore roommate, played varsity squash at Williams. I remember seeing his picture as one of the many team photographs that lined the walls of the old gym. Walking by those snapshots of Williams history each day on my way to practice provided me with a great sense of the players that had come before. Years later, those emotions were perfectly captured by Robin Williams in “The Dead Poet’s Society” when he takes his class to view the old photographs on the walls of his fictional New England prep school. Decades from now there will be another young man at Williams who will walk down those halls on his way to practice. Perhaps he will play squash like TB Jones and I did (although I hope that he plays more like TB than like me). Perhaps he will go on to the Marine Corps, like TB, my father and I. Whatever his future might hold, I hope that he sees our pictures and wonders about us, about where we went from Williams and how prepared we were for the journey. I hope that he realizes how fortunate he is. The glory of Williams athletics lies not in our wins and losses. TB Jones and Frank Uible last wore the purple and gold more than five decades ago. I left behind my playing days before today’s Williams freshmen were even born. Almost no one recalls the games we won or the games we lost. But play them we did, with just as much heart and nerve and sinew as the Ephs who stand in our places today. “Carpe diem” — Seize the day — was the message that Mr. Keating sought to instill, a message appropriate for his high school students. Yet Williams athletes, adults for all those with eyes to see, should be beyond such exhortations. For them the message should center on their relationship to Williams history, to the players that have come before and to those that will follow in the years and decades to come. 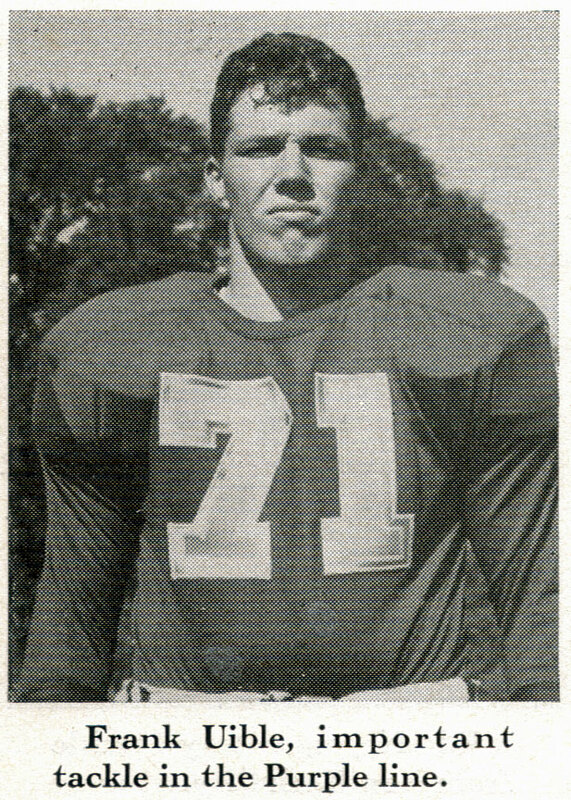 Which lineman tomorrow will play in Frank Uible’s position? Which squash player this winter will occupy TB Jones spot on the ladder? Does football coach Aaron Kelton remind his players of the history of those who have gone before? Does he know their names and their stories? Williams may win or lose tomorrow. Yet, in the longer sweep of history, one game, one loss, is as dust in the corridors of memory. What matters is the day itself, and the place we each occupy within the traditions of the Williams community. 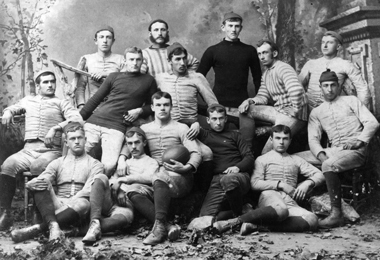 No one remembers the score of the game these men played 100 years ago. But we look in their faces and see ourselves. I am Frank Uible ’57. I am TB Jones ’58. EphBlog is powered by WordPress and delivered to you in 1.477 seconds using 53 queries..